341st day of the year. There were then 24 days left in 2018.
on the 49th week of 2018 (using US standard week number calculation). 77th day of Fall. There were 14 days left till Winter. December 7, 2018 was the 6th day of Hanukkah (Jewish Observance). 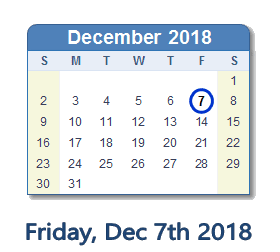 What happened on December 7th 2018?